Borrow a single coin from a spectator. From your pocket, take out your pack of chewing gum or cigarettes. Show it from all sides. There's nothing to see. Illusion or not? Pull back the cellophane just a bit and your spectators will see that the penetrations is real - the coin is really trapped in the cellophane! In order to free the coin, you or your spectator will have to pull the cellophane all the way back. Illusion or not? Immediately hand out everything to your spectator for close examination. The cellophane is absolutely ordinary, as is the coin. No openings or trickery. The coin, of course, can be examined. Remember you can borrow it. How is it possible that in full view a single coin could pass through an ordinary cellophane wrap? Your spectators will be wondering for a long time! 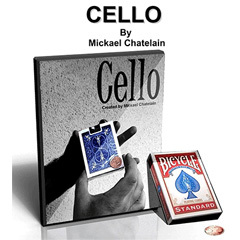 • Cello is really easy to do. You will doubtless carry it with you at all times. • The coin is on the other side of the cellophane in a fraction of a second with no manipulation. • Choose your own presentation - with a card case, pack of cigarettes or chewing gum. • Hand everything out for examination right away, as the workings are completely undetectable. • The effect is extremely convincing as nothing is hidden from the spectator. You bring a coin up to the cellophane and it penetrates. It's as simple as that. in short, nothing is left out.